Using the RAHS Health Center is easy! Find the registration form you need below, complete it, and send it or bring it with you to the health center at your school, or the school nearest you. Call to schedule an appointment in advance. Registration forms are also available at each of the health centers. 2018-19 Pediatric Registration and Consent Forms: Read the registration packet requirements and review the Notice of Privacy Practices. Print pages 2-9 and complete the forms and send or bring the completed packet to a RAHS health center. 2018-19 Pediatric Registration and Consent Forms – en Espanol: Lean la Carta de Bienvenida para cumplir con los requisitos de inscripcion y revisen los documentos de Notificacion sobre Politicas de Privacidad de UMHS. Impriman las pagina 2 a la 9, Ileneen los documentos. Print the two-page form. Complete and sign consent. Return the completed packet to a RAHS Health Center to schedule a sports physical appointment. Patient Rights and Responsibilities and After Care Hours: What you can expect from your school-based health center, as well as our contact information. Notice of Privacy Practices - English: Confidentiality and security practices of UMHS and RAHS. 2018-19 Adult Registration and Consent Forms: Read the welcome letter for registration requirements and review the Notice of Privacy Practices. Print pages 2-9 and complete the forms and send or bring the completed packet to a RAHS health center. 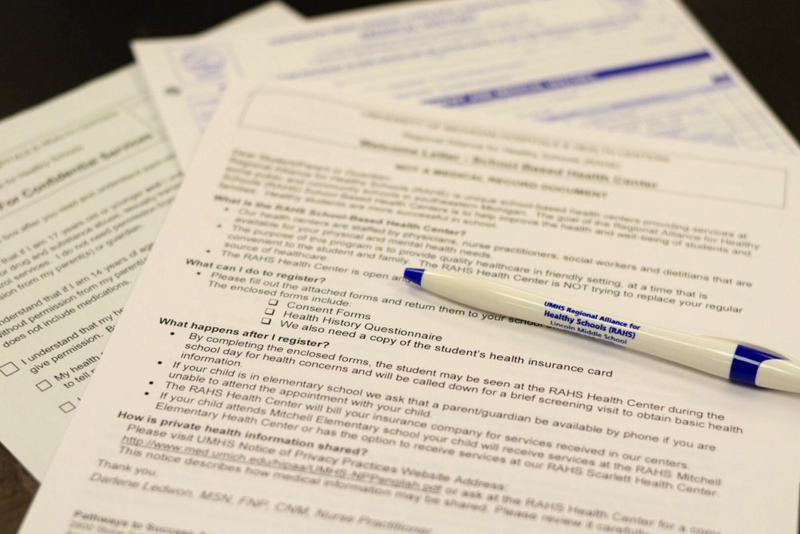 2018-19 Adult Registration and Consent Forms – en Espanol: Lean la Carta de Bienvenida para cumplir con los requisitos de inscripcion y revisen los documentos de Notificacion sobre Politicas de Privacidad de UMHS. Impriman las pagina 2 a la 9, Ileneen los documentos.